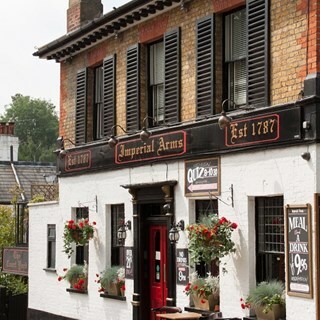 The Imperial Arm Pub is open from 12 till 11 Monday to Saturday and 12 till10.30 Sundays. Serving food from 12 till 9pm Monday to Saturday and 12.30 till 6 Sundays. The Courtyard Wine Bar Restaurant is open Thursday, Friday and Saturday from 7 till 11, Saturday and Sunday from 12.30 till 6pm where you can choose to have our famous roast dinner in either the Pub or the Wine Bar. You can book tables at both on the widget below – just select the restaurant you want or call us on 0203 605 7899. 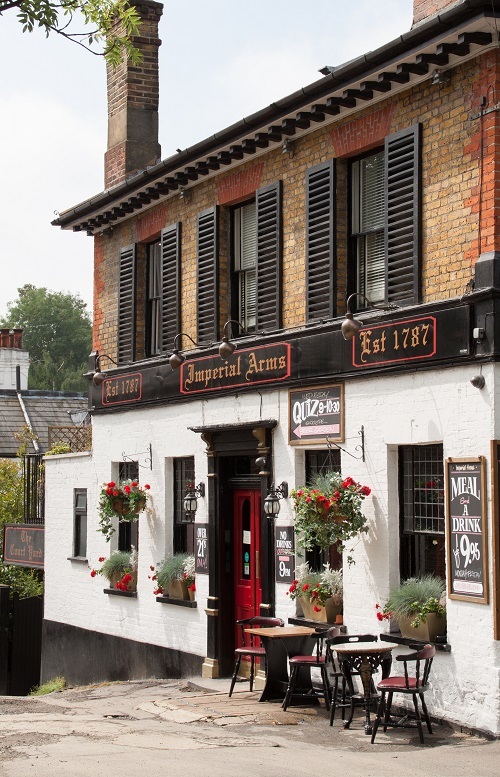 The Imperial Arms Chislehurst – Family run Pub and Courtyard Bistro and Function room, with outstanding food, the finest wines & real ales is an exceptional Gastropub. Recommended in CAMRA's 2019 Good Beer Guide, Trip Advisor Certificate of Excellence 2018 & Cask Marque accredited 2018. The Function Room is available for hire holding up to 45 for a buffet or 24 for a sit down. Please call to discuss any needs you may have. Great pub with great food and staff! Fantastic location for family celebration. Russle was friendly and could not do enough to make the day go smoothly from sourcing music suitable for the occasion  to running the bar and ensuring everyone’s needs were met. Food was lovely as usual and Tina was also in hand to ensure everything went to plan. Could not have asked for a better day, everyone commented how lovely it was. Thank you all. Great meal and really good service. Took our friends here who were visiting from Wales and had a super evening. Our waitress was especially friendly. Thank You. The friendly service, food and atmosphere was all great! We ate in the bistro which was really intimate and lovely for families. We will definitely be returning. We were given a great table. The ladies were super attentive in taking our order and bring our food. The food, I had the port belly, was amazing! And lots of it. Great value. We were shown the bistro which is very smart. I think this pub is better than the more fussy and expensive Bull Inn up the road. A lovely meal with excellent service. Will definitely return. Your service is over and above excellent. I have been several times with my family and friends and absolutely love it. Thank you. Thank you Tina and team we had a great lunch meeting in the bistro. Great atmosphere great food and staff always friendly. Delicious food, gorgeous setting however forgetful service. Had to ask for drinks, poppodoms weren’t brought out and the owner was very standoffish when I asked why a table were served their food before us even though they arrived at least 45 minutes after us. This is the third time I’ve visited and each time the service has been very slow. From the moment we arrived we taken care of beautifully, the young lady who served us was very attentive and knowledgable about the menu. We shared at the sharing platter to start, followed by the giant Scampi and a lovely Burger, the fries were delicious too! We wouldn’t hesitate to return! I came here for a meal with my parents, as they were visiting me from Scotland and Cornwall. We had a beautiful meal and the service was amazing. This is our local pub and we have been in a few times for a drink, but we will definitely eat in here more often. We all finished our plates and it was the perfect end to a lovely weekend. Thank you. We were able to book a table for 9 at very short notice and were treated like royalty from start to finish! The Bistro is beautifully decorated and has a very warm & relaxing atmosphere. We all enjoyed our food, and my niece was apparently the first ever Vegan to try the vegan cheese board!!! - and she was delighted with it. Great choice of dishes for everyone - we particularly liked the new vegan nachos and umami burger. Wonderful place to eat and drink. We went on Curry night and had the Vegan Thai curry which was lovely. Really recommend!